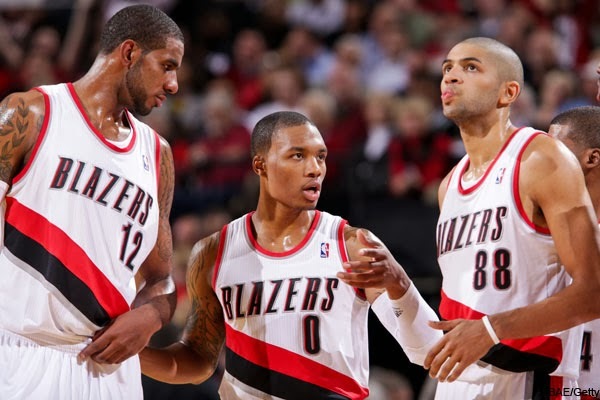 While other teams have garnered headlines, the Portland Trailblazers are off to an 8-2 start. I was going to write about the Indiana Pacers this week. I had a whole column lined up and everything. I was going to write about the Pacers being 10-0, the first team to reach double digit wins without a loss since the 2002-2003 Dallas Mavericks. Which, in case you have already forgotten, was a pretty good team. But the Pacers lost to the Bulls on Saturday night, so writing about a 9-1 team that has already received a lot of coverage didn't seem so appealing to me any more. Besides, the High Ayatollah of Basketball Writing, Zach Lowe, just wrote a fantastic analysis of Lance Stephenson, the Pacers' secret weapon, last week. You can read that. My backup post was going to be on emerging Utah Jazz star Gordon Hayward. However, while I really admire Hayward's game and the way he has molded himself into an NBA player, it's still too early in the season to do a true deep dive on how far he has come. So, instead, I want to talk about the Portland Trailblazers. Why? Because the Blazers are 8-2, which is good for second place in the highly competitive Western Conference, and no one is talking about them at all. We can't blame it on the Blazers having some kind of Spursian* proclivity to operate under the radar since they play in a market that is firmly planted in the general cultural consciousness. What we can blame it on is the bevy of other interesting or buzz-worth story lines—the Pacers' undefeated start, the visible rust of Derrick Rose and his fitting back in with the Chicago Bulls, the mess in Cleveland, the mess in New York, and the Brooklyn Nets wildly underachieving—and just a bit of basketball media laziness. However, early on, the Blazers certainly look for real. They are eighth in the league in points per game (103.1), seventh in rebounds (44.9), and tenth in assists (23.0). All-Star power forward, LaMarcus Aldridge, is putting up his usual numbers. Through ten games he is averaging 21.9 points and 9.1 rebounds, though he is shooting just under 50% and is taking about twenty points per game. Damian Lillard is showing no signs of a sophomore slump as his numbers (19.6 points per game, 5.6 rebounds per game, 4.8 rebounds) are basically a mirror image of his Rookie of the Year campaign last season. He is shooting a slightly lower percentage, but his PER is a tick up, from 16.4 last year to 18.5 this year. Meanwhile, new starting center Robin Lopez is doing all the dirty work in the middle. He's averaging 8.1 points, 7.6 rebounds and keeping opponents to shooting 46% around the rim. He's clearly not in the upper-echelon of centers in the league, but he is doing his best Tyson Chandler impersonation and that is much more than the Blazers were getting last year from Meyers Leonard & Co, which has certainly helped towards Portland ranking 11th in points allowed. Wesley Matthews and and Nic Batum are also performing at or above their career averages on the wing. Matthews is shooting 50% on three pointers, 54% overall, and 47% on catch and shoot opportunities, which is what Portland needs him to do when he is on the receiving end of Lillard kick outs or post passes from Aldridge. Batum is stuffing the stat sheet, as per usual, with 13 points, 6.4 rebounds, and 5.4 assists per game. With the additions of veterans like Mo Williams and Dorell Wright, as well as the unfairly maligned second-year player Thomas Robinson, the Blazers have a much greater variety of respectable lineup combinations to play with than they did last year. In the seven games that the Blazers have used Mo Williams at the point guard with the rest of the starters, the offense has been just as productive with Lilliard at the helm. And the Lopez, Aldridge, Wright, Matthews and Williams lineup (thought used in only two games so far) shows signs of potentially being a dangerous combination with plenty of high percentage shooting and floor spacing. And they still have yet to incorporate promising rookie C.J. McCollum, who has been sidelined by injury. McCollum could present another wrinkle for opposing defenses to game plan for, but he could also serve as a positional redundancy. Either way, he becomes another asset the Blazers can use to bolster their future, whether that be via an eventual trade, or simply as a potential dynamic Sixth Man. One knock you could have on the Blazers' early season success is that their schedule hasn't been that impressive. In order, they've beaten the Nuggets (kind of a mess), the Spurs (San Antonio's only loss), the Kings twice (a messy but dangerous team), the Pistons (a mess), the Suns (surprisingly competitive), the Celtics (feisty and somewhat intriguing), and the Toronto Raptors (what kind of team are they?). But, and excuse the sports talking head rhetoric here, all you have to do is beat the teams you have in front of you on the court on a given night—and the Blazers have been doing that. The team's expectations might be a little more realistic after this week when they play at Brooklyn, away at pathetic Milwaukee, home against the Bulls and away at the Warriors all in a six day span. At this stage of the season, everything should be take with a grain of salt—a grain of salt that we who follow sports like to call "small sample size." It's everyone's favorite sobering phrase! That being said, the Blazers' start has been surprising and they are a team to be watched, as they should very well be in the mix for the 5th, 6th, or 7th seed in the West. Crazy how little press Portland has received. Explosive and balanced lineup. It will be interesting to see how they fare against New Jersey tonight.